10 Comments on Bio-bags. Dead easy and a great way to do Bokashi. I keep talking about bio-bags. And to be honest I’m not completely sure what they’re called in different countries. But they are basically these — a roll of bags that work just like plastic bags but that are made from corn starch. Organic in other words, and they will break down in the soil. Step one is to put the bag in the bucket just as you would a normal rubbish bag. 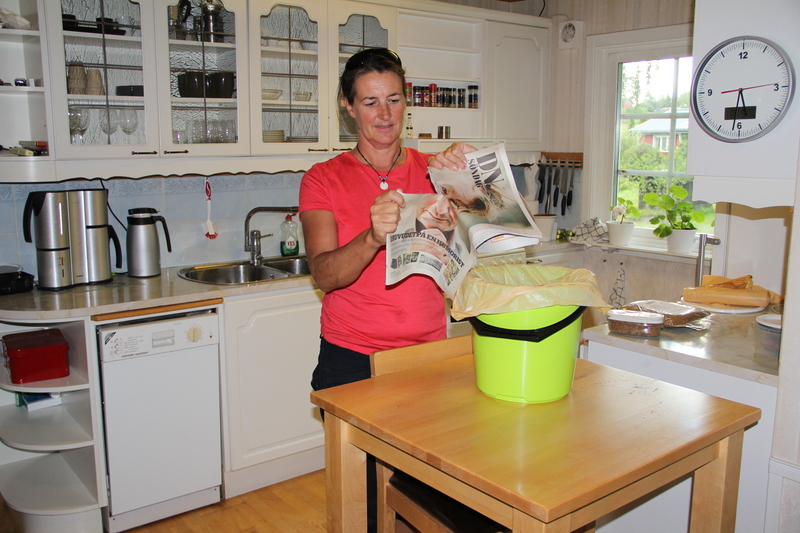 Then put in some newspaper to take up the liquid that the food waste will produce. You’ll learn pretty quickly how much you need, I usually tear the local paper in two and just plonk it in. If you have wood pellets, hay pellets, cat litter or anything like that on hand you could test it. Anything will work as long it’s cheap and easy to get hold of, will absorb a lot of liquid and you’re happy about having it in your soil. A sprinkle of Bokashi bran on top of the newspaper layer then you’re ready to tip in your days food waste. Just as you would with any other bucket. A little more bran, some extra paper if it looked like it’s going to be wet. Serviettes are ideal if you use them at home. Otherwise kitchen paper, egg cartons, dry bread. You’ll get the hang of it soon enough. How much paper (or whatever) you use will depend partly on how wet your food waste is and partly on how long you plan to store your biobag. Let the food drain as much as possible before you put it in and you’ll save yourself some trouble. If your bag is going to wait a few months before going into the soil I’d say be a bit generous on the absorbent front. 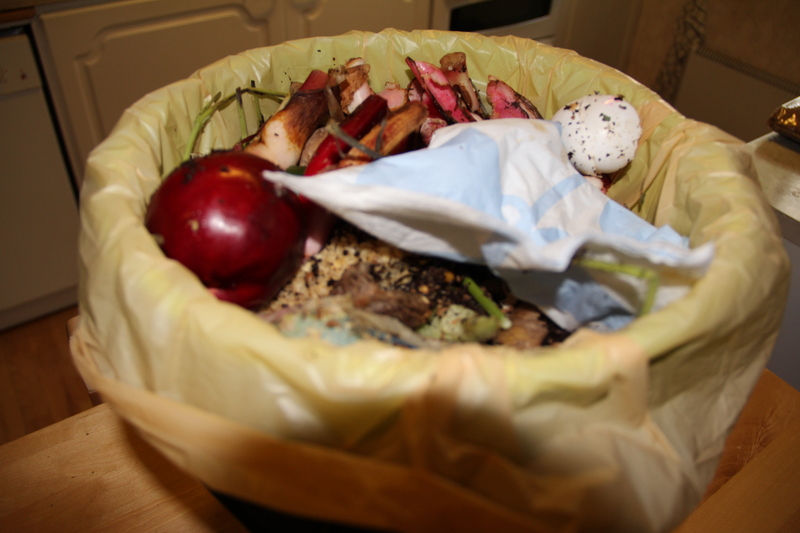 Food waste just goes on getting wetter as time goes on (unless you have it frozen out in the snow, but one day it’s still going to thaw). The quality won’t be particularly better or worse if it’s wet or dry but there will be a big difference in the smell. Wet = smelly. No way round it. So aim for damp or dryish if you can. It’s usually worth squeezing in an extra section of newspaper before you tie up the bag. Final step: tie a good tight knot in the bag and carry it out to your storage spot. The bag will still need to ferment in a warm spot for a couple of weeks, just as in any other bucket. But the advantage is you don’t have to clean out the original bucket. In fact, you only really need the one bucket as you can remove the bag as soon as it’s full and use the same bucket again and again. – That the bio-bags you use are good and thick. We’ve tested a lot here and many are extremely flimsy. They will drive you nuts. The thick bio-bags will take time to break down in the soil (4 to 6 months even), but you can hack them up with a spade when you “plant them” to speed things up. At least you know they are organic so you don’t have to worry about getting plastic in your soil. – That you have somewhere warm enough to store them for a couple of weeks. 20 degrees C is about right, depends of course where you live. Room temperature in other words. It can work in a coldish cellar but you’d want to make sure the bucket got going properly in the kitchen before it hit the cellar. – That the bags are airtight — knotted tightly or with a good tight clip on. They are your “bucket” and the microbes just don’t like a lot of fresh air at this stage. – That you have somewhere to store the “ready” bio-bags if you’re keeping them till spring or storing for someone else to carry away. One option is to load them into black plastic rubbish bags, another is to keep them in plastic barrels or bins. Whatever, as long as it works for you. I wrote a bit in the previous blog about how we collect Bokashi bags from a pre-school and an office building. It’s honestly so extremely easy once you get going. And the bio-bags do make it easy on a lot of fronts. – the process is a lot cleaner, especially valuable in an office environment where no-one wants to do the icky sticky stuff. – it’s easy to hand over the bags to someone else for their garden. They don’t even have to see what you had for lunch! – it’s easy to store the bags as long as you need until spring comes or you have some time to do some gardening. and four, it’s easy just to plonk a couple of bags in the wheelbarrow when you have a garden project on the go and plant the whole bag in the right hole in the right spot. You don’t have to deal with all your bags at the same time, just use them up gradually as you need some fertilizer in the garden. So the way we see it, this opens up a lot of possibilities for the future. The key to making this whole Bokashi thing happen is that it has to be easy. Preferably nice and clean and preferably without a lot of digging involved. So we’ll keep inventing things till we find the path of least resistance. Then it will be easy for everyone to start getting their food waste back into the ground and getting us back on track so we can grow the food we need in the future. Thanks Jenny, it just gets easier and easier, more practical and easier to spread across communities. I am definitely finding bio-bags before I take my Bokashi away next week as I’ve been thinking just how small my second bucket is now that just about anything from 4 families goes in. We normally fill a few kitchen tidy bags over a weekend away and we eat fresh lovely barbequed meats, salads and fruits. Biobags might just mean we won’t have enough room in the ute (don’t know what you call it – US calls it a truck) to bring all the Bokashi bags back home. I didn’t blink when you mentioned the name biobags previously so sure call something similar here, but I’ll let you know what I find at the shops. Leads me to yet another question. I try to ask my questions publicly of someone who actually knows as I have seem some forums where “I dunno” is advising “me neither” and the info is, even to me, wrong if not downright dangerous if someone follows what they read without getting wised up first. 25 – 35C days. As we’ll be travelling for a couple of hours, is my ferment going to care if it’s in the back of the ute in the sunshine? My belief is cold hurts (betting you are an expert on that one), but not sure how hot is still ok? Hi Kerrie! It’s really cool to have you onboard with all your questions and ideas! Hope it worked with the bio-bags you got hold of, otherwise it’s just to keep testing. If you get desperate, plastic bags always work. And they’re not that hard just to shake out into the soil. But heat is actually an issue. You should check the Dubai page — they have to tell people to keep their Bokashi buckets indoor under air conditioning!! But I’ve lived in Sydney for many years too so I know how damn hot it can get. Even when it rains! 50 degrees C is about your limit for Bokashi microbes. So a bag/bucket in the sun on the back of a ute could be a bit hot. But you’re not driving that far so if you just put the bag in the coolest corner under a tarp or something you should be fine. You could always toss in a bit more Bokashi bran when you get home to reinvigorate the microbe population in your bucket. Have a great weekend! Maybe you’ll convert a few more families while you’re away??!! Hi Jenny. It’s actually really cool to have you here often answering questions and not with mumbo jumbo if you aren’t sure, we all find out together. Thanks for the advice. I don’t know what the family would think if I put a bunch of filled fermenting bags alongside them in the car because I don’t want them getting too warm. LOL They are on my side at the moment, best keep it that way. As you said, we will just keep on trialling ’til it’s perfect. However, gotta say I’m pretty happy with where you’ve got us to so far. I’ve done way messier things with compost, liquid manures, etc. Just stumbled across this blog and your comment. Love the idea of bringing the waste home to be used not landfilled like what happens on our car club trips. Could you put the filled bags in an empty esky (cooler for non Aussie’s) for the trip home? Should keep them temperature controlled for a few hours, I always hose out the esky’s at home, wipe down with vinegar and let dry completly before putting away a few compost bags shouldn’t cause a problem,. I took two 10 litre buckets with me so I could have one where food was getting chopped up and move another one to where it was being eaten. I could not believe how much went into these buckets. I just kept pressing them down. Ended up filling the two, tieing the bags up and leaving in the buckets (under a tarp) for the trip home. We used paper plates, ate dozens of eggs – and the cartons all went in along with bread, bones, seafood scraps and lots of salad and nibbly scraps. I just kept on adding Bokashi bran and pushing it down; no drama. i expected to be doing the BBQ runaround with a garbage bag getting everyone to put their plates and scraps in. 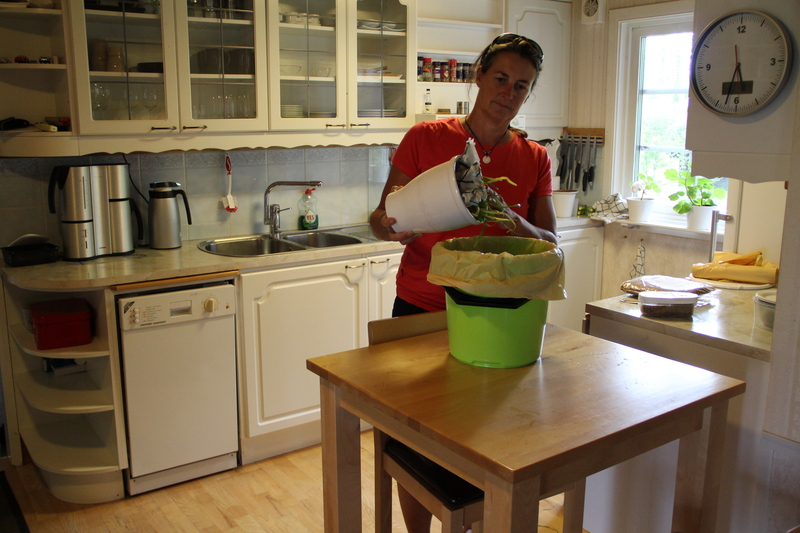 However, I found it easy to just bring the bucket and everyone was happy to clean-up into it. It’s much easier to throw a plastic bag, lid or paper plate on top and just push it down. I don’t think a loose plastic bag would be able to end up as tightly packed. I had to use biodegradable bags as I hadn’t found suitable compostable ones yet, but I was still worried about tearing them on the way home so was happy to just leave them in the bucket and keep them sealed up. When I got home I took them out, double-bagged them and put them in an old metal garbage bin to finish their ferment. When I did take the bags out of the buckets there were some small holes (remember I had bones, prawns, the works going in. So, I’d say putting your bags in an esky would work fine. Not only would it keep them safe from the Oz sun, it would save you from worrying about puncturing them when you tie the load down. Maybe double bag them when you take them out of the bucket. It takes a little while for the ferment to get started so you’ll find you’ll just have rubbish that doesn’t smell to bring home, depending on how long you’re away of course. It couldn’t be easier. If you, or anyone you know, gardens this is an amazingly easy way to get a lot of soil building Bokashi together in a short space of time. Friends don’t mind as you spend the whole time assuring them “Yep, that can go in, too”. Thanks for popping in Tane. Keep an eye on what Jenny is up to as she is always trialling new easy ideas. Hope you get a chance to do the holiday Bokashi soon. Let us know how it turns out. I went out and bought some for my kitty litter bokashi experiment, and it’s sooooo great! I love it! I will definitely be doing this more for the cat litter than the other stuff. I had difficulties finding the right way of saving the “goods” but this is a great idea! Hi Martina! Great to hear! Sometimes I feel like we’re feeling our way in the dark here a bit, it’s so encouraging when others can test these ideas and find out what works and what doesn’t. By the way, what brand bags did you buy, where did you get them and what did they cost? Maybe we could help others get started here by making it easy. What we found when we started testing bio-bags was that many are quite hopeless. They’re made for carrying the veggie peelings straight from the kitchen out to the compost bin and are probably fine for that. But for our purposes they drive you nuts. They tend to be flimsy and tear easily, especially when you try to lift up a full bag. They are often “breathable” which means they’ll sweat Bokashi juice and therefore smell a bit. They’re often not strong enough to survive a 4-month winter storage. But all this you figure out quite quickly and it’s hardly the end of the world if at first you don’t succeed. But valuable if we can share our tips! btw enjoyed your youtube clips! I love the idea of making it easy. Here’s what I am wondering, as a considerably lazy individual (well really it is that I have lupus), I don’t want to clean out a bokashi bucket and would prefer the drier, lighter product; what about using a bio bag in the grated bokashi bucket with holes in the bottom of the bio bag. When the bucket has done its job, I take the bag with holes and drop in a second bio bag to store for the garden. I still get the tea to water my plants and I get a lighter, more compact product to wait until the snow melts. This seems like it would work, am I missing something here? You’re far from being alone in not wanting to make things easier. So the more ideas we can test out the better, one day we’ll find the simple, genius solution that makes it REALLY easy. Your idea sounds reasonable, definitely worth testing. It could be that you face a tradeoff, the bag might not drain that well and that could make the Bokashi smell a bit if it gets wet and mushy in the bottom. But step two, putting it in another bag for storage would definitely work. What I do in the winter (and our winters are probably the light version of yours!) is have one tap-bucket running over a long period of time that I add some food waste to now and then and drain off the tea as needed. 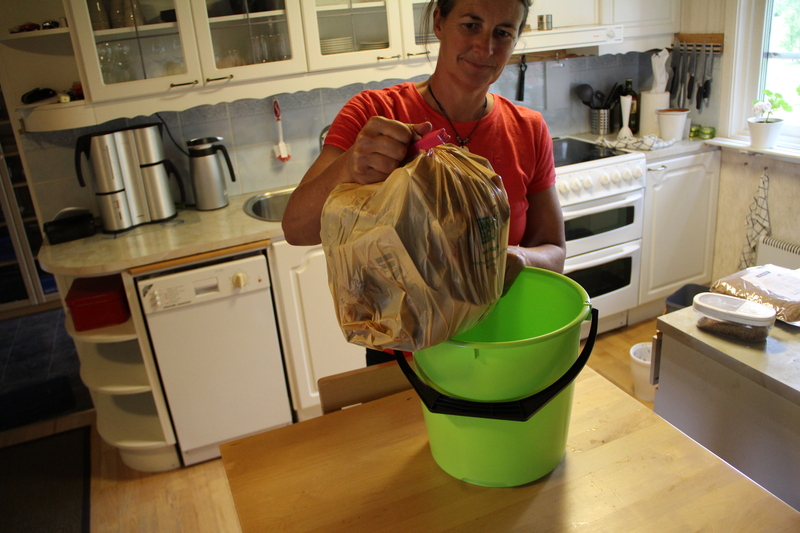 The rest of our food waste at home goes into plain buckets with bio-bags. This works really well in the winter as storage is the main issue and the plants don’t need much fertilizer. During the growing season I tend to run the tap-buckets quite hard as I want all the Bokashi juice I can get. (And it’s easier to hose out the buckets when you’re out in the garden anyway). It would be fantastic if you could give it a go and let us know. Hope your winter doesn’t go on forever!!! Previous Entry It can be done! Bringing home Bokashi to your veggie patch.